This post covers the readings from The Acts of the Apostles for the Fifth Week of Easter, Acts 13:13 through 16:15. For a list of all the readings through the Easter season, click here. We’ve reached the half-way point in the book of Acts, and things are happening. The story begins to shift. The well-known older personalities are saying their final words, and new characters come onto the screen. The small band of Jesus followers is growing. Leaders who didn’t know Jesus personally are appearing and sharing their story. Change is happening. In an earlier chapter, we read the Jesus movement has been given a name. In Antioch, the disciples were first called Christians. This suggests the Jesus followers were different enough from their original communities (likely forms of Judaism) that people in the city gave them a distinguishing name. These newly-named Christians are on the move. This shouldn’t be surprising. Remember, Jesus says they will be his witnesses to the ends of the earth in the first verses of Acts. At this point, the ends of the earth include Antioch, Cyprus, and Iconium. Most study Bibles have maps that locate these places, as well as other major cities of the era. Take some time this week to see the journeys of the apostles of the early church. Remember most people walked or took boats to get from place to place, so a journey that takes us a few minutes to read took Paul and Barnabas weeks to walk, which is a good way to remind us all we aren’t reading a series of event that took place in a few weeks or months, but over almost 30 years. We are introduced to Paul and Barnabas. Several other people are mentioned, but these two are the headliners of the next part of Acts. The Holy Spirit picks them for particular work, and off they go. And here, we read, that Saul is now called Paul. And Paul, we read, tends to create passion for Jesus and no small amount of controversy wherever he goes. The Church, then and now, is a loose association of people who believe in the Gospel of Jesus. How they expressed this belief started with the fundamentals of a confession of belief in Jesus Christ, repentance of sins, baptism, and the fits of the Holy Spirit (Acts 2:37-38). But as the community of early believers expanded from a fairly homogeneous, mostly Jewish community into one that integrated gentiles, how people followed Jesus became nuanced and varied and remains so. As we can imagine, these newly-formed groups of Christians had various ways of following Jesus. We can surmise they all practiced baptism, but from there, I suspect communities developed distinct ways to follow Jesus, reflective of their communities, cultures, and experiences. And this diversity, this multiplicity of people and ideas leads to controversy. We have, in this week’s reading in Acts, the response to that controversy, the very first church council, the Council at Jerusalem. By and large, church councils are called to address points of divergence and reach some consensus. Most ancient councils were called to address heresies, but this ancient practice of the church to come together to discuss points of disagreement and enable the church to talk with each other as we discern how we follow Jesus continues in our Diocesan and General Conventions. The Council of Jerusalem addressed the issue of circumcision; particularly, did those gentiles who became Christians have to be circumcised? As you can imagine, adult males in the world before anesthetics and antibiotics had a very practical reason to be concerned about this particular aspect of following Jesus. This controversy arose because the church expanded beyond the Jewish community. One party, we read, held that all males who became Christians had to be circumcised in accordance with Mosaic law. Paul, Barnabas, and others disagreed, and they traveled to Jerusalem to meet with the apostles and the elders. After much debate, Peter speaks (for the last time in Acts) and the Council makes a decree: no, gentile converts to Christianity don’t have to be circumcised, but they, along with, we may presume, all Christians, should abstain from that which has been sacrificed to idols, from blood and from what is strangled (some texts do not have this part) and from fornication. I imagine the letter being read to the early Christian communities with some relief, but also with some confusion. What, exactly, is this blood and strangled business? And how much bewilderment (and no small amount of violence, pain, and shame to many people over the ages) has the mandate to abstain from fornication caused the church? Some scholars relate these back to Levitical mandates, but again, how many early Christian communities, especially those with a majority of non-Jewish members, would have been intricately familiar with Leviticus? How many of us now are? Church councils seem to clarify one issue while adding confusion to twenty-five new issues. We want sure and certain, not only in our faith, but in how we live our faith. But we must remember we are trying to form structure around the great mystery and diversity of the body of Christ and a holy love for God and neighbor expressed in daring, different ways. Add in the passionate, unpredictable movement of the Holy Spirit, and we can see the soil for conflict. That does not mean we exist without any structure, without any order. But it might mean we realize that our insights, our deliberations, and our mandates, guidelines and rules about Christianity must be nestled in humility because they might be wrong. Maya Angelou has a wonderful quote, “Do the best you can until you know better. Then when you know better, do better.” Too often in the Church we do the best we can, then when those among our community invite us to know better, we ignore them while clutching our decrees of the past. We are, instead, invited by God to open our minds and hearts, selves and souls, to knowing better and doing better. 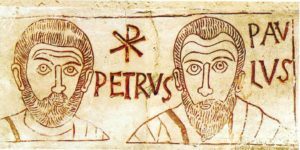 Peter, Paul, and the early followers had distinct ideas about what being a Christian meant – and they didn’t agree. So they made some decisions, some helpful, others not. Then time went forward, and we made more decisions. Some of those decisions have stood the test of time; others have not. We now know better or have admitted we need God to help us know better and do better on slavery and racism and its deeply damaging legacy to the body of Christ, how we have denied equality to women, and our destructive relationship with human sexuality, particularly how we as the church have treated LGBTQ members as less than beloved by God. We are constantly as Christians being touched by the Holy Spirit to know better, and then to do better. This week, I invite you to pray for the councils of the church, from your local church councils, vestries, and leadership to the national and international disciples who gather to make decisions. Pray that they will be guided by the Holy Spirit and sustained in courage to make decisions that expand love and empower disciples. Perhaps share with them that you are praying for them. Pray that we will have the humility to admit we are still learning to know better, and when we do know better, that we will have the courage to do better. Encourage church leaders, lay and ordained, in their ministry on these councils and, if you have not served on a council, perhaps pray and discern if you are called to engage in this ancient and orthodox Christian ministry. This summer deputies (elected church members, both clergy and laity, from each diocese) and bishops of the Church will gather in Austin, Texas at the Episcopal Church’s General Convention. We will worship together. We will pray in our diversity. We will disagree in our diversity. We will consider legislation that will address issues important to our Church and to us as Christians as to how we live out our faith. You can click here for the official General Convention website to follow the work of General Convention. Add the General Convention to your prayers – the ministry and work of the Convention and the people gathered. Almighty and everliving God, source of all wisdom and understanding, be present with those who take counsel in the church for the renewal and mission of your Church. Teach us in all things to seek first your honor and glory. Guide us to perceive what is right, and grant us both the courage to pursue it and the grace to accomplish it; through Jesus Christ our Lord. Amen.